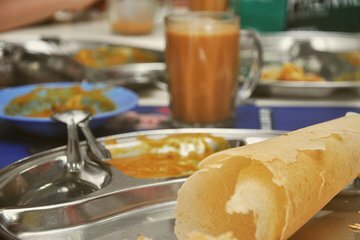 Explorez le pittoresque quartier de Chow Kit lors d'une excursion gastronomique de 4 heures dans l'une des destinations culinaires les plus intéressantes de Kuala Lumpur. Vous apprendrez comment commander et manger comme un habitant et suivrez votre guide local à travers un dynamique marché de produits frais, tout en écoutant les secrets qui se cachent derrière vos plats malaisiens préférés. Faites une pause pour une série de dégustations à trois endroits, et goûtez au moins dix des spécialités locales de Kuala Lumpur. Découvrez quelque chose de nouveau en plongeant dans les goûts insolites de Kuala Lumpur. Ezy greeted us so excited to us like we were friends who haven't seen each other in a while. 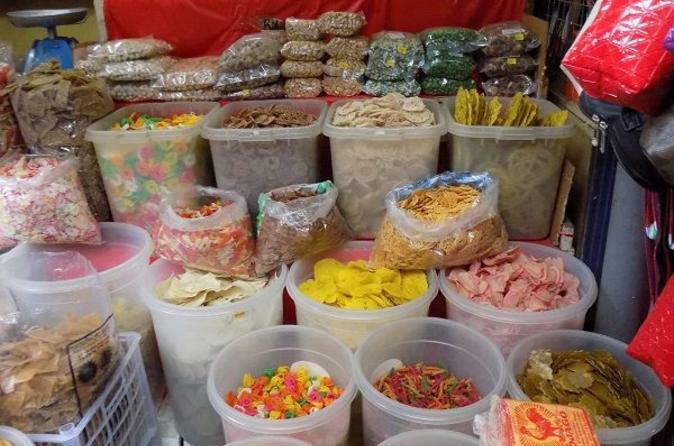 We began our walking tour with our first stop at a local sweet cart. The little cakes and the peanut butter tasting pancake were delightful. We experienced a very colorful dried noodle and rice market. Here were tasted two different types of noodle dishes. Then, we were taken through a large market with fresh fruits, vegetables, then then the wet section for meats. Exiting this market we were on a street where locals were setting up for the evening night market. We headed to another semi outdoor cafe and tried satay, fried dough and a coconut iced dessert that were delicious. After a brief rest because of rain, we walked to a small Chinese restaurant that only serves one noodle dish. It is famous for it's secret seasoning. It lived up to it's reputation. The secret seasoning had a wonderful roasted pepper flavor, but you have to eat the dish to try, you can't buy the seasoning to go. The last tasting spot was at an Indian cafe. We tried unique breads and this dish too was very good. Our guide had a true passion for food and enjoyed sharing information about food and history of the city. This tour is definitely takes you into the local markets where everyday locals go. So foodies, be adventurous! If you want to eat in the backstreets then this is the tour for you. I cant say I enjoyed it. I found it very overwhelming and the markets were very confronting in the meat section. I suggest this tour is not for Westerners. Our guide was great, however, this was not a great experience for me. Just what we were looking for in a food tour! Pauline really knows KL and the wet market. We enjoyed the walk thru the wet market and tasting various prepared foods as well as fruits and vegetables. Not something we would have done on our own and wouldn't have known what-was-what without a guide. Chili-pan-mee was the best meal we had in 3 weeks in KL! I couldn't finish it or barely touch anything at the final stop. Highly recommend this tour! Jasmin, who guided this tour, was very enthused and knowledgeable, and made the four hour tour a real treat. The information and background she gave on KL and Malaysia was as interesting as the food and meal samples. If anything there was too much food, and I think perhaps we should have resisted the small treats along the way and just concentrated on formal dishes. By the time my group got to the last stop, which was an Indian restaurant, we could not do justice to the food, which was in fact wonderful and some of the best of the afternoon tour. The markets were a revelation, especially that they were open 24 hours, and Jasmin gave us a detailed tour through them, providing loads of background. Certainly did not need dinner that evening given the amount of food sampled during the tour. Jasmin was an excellent guide, and made sure we knew what we were sampling and provided drinks to go with the dishes. She even helped each of the tour party with detailed directions on how to get back to their accommodation from Chow Kit. A recommended addition to your KL program, that's for sure. Awesome tour. Loved the variety of foods offered. The interaction with Mimi, our guide was amazing. She was very familiar with the area. I felt as if we were truly experiencing this from a local perspective.